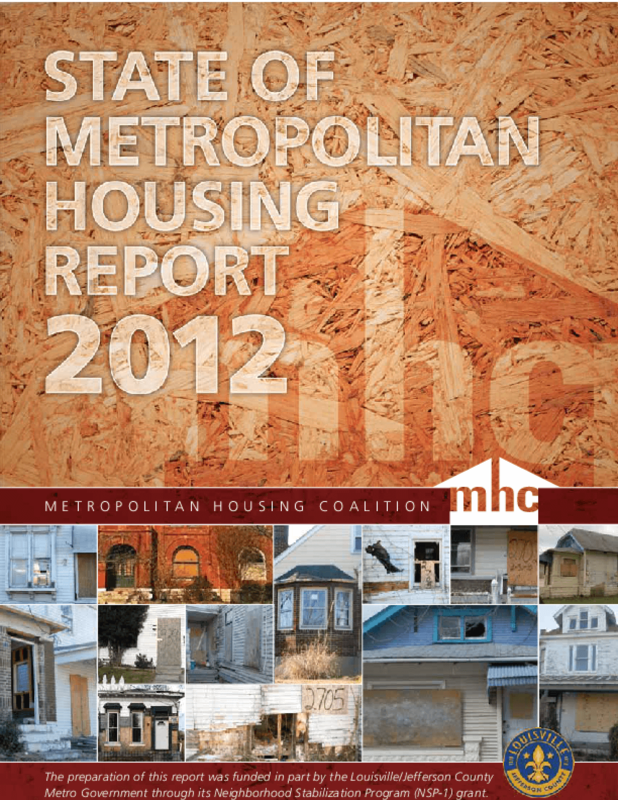 This report updates Metropolitan Housing Coalition's nine annual measures of fair and affordable housing for the Louisville, KY Metropolitan Statistical Area: Concentration of Subsidized Housing; Housing Segregation; Renters with Excessive Cost Burden; Production and Rehabilitation of Affordable Housing; Homeownership Rate; Access to Homeownership; Foreclosures; Homelessness; and Community Development Block Grants (CDBG) and HOME Funds. The 2012 State of Metropolitan Housing Report clearly demonstrates Metropolitan Louisville's growing need for safe, fair, and affordable housing. For the first time, the tenth annual State of Metropoltian Housing Report includes data on the number of children experiencing homelessness in the MSA's public school systems; before MHC reported only on Jefferson County Public Schools. The 2012 report also includes a focus topic: vacant properties and their impact on the community as well as current efforts and best practices that to address this issue. Additionally, the report also drills down into the Neighborhood Stabilization Program, a federal program designed to address the issue of vacant properties, and how it was used in Louisville. Copyright 2012 Metropolitan Housing Coalition.